Drool, er, dream the night away in the original Pizza Bed. A cheesy duvet, saucy sheets and crusty pillows compose this savory bedding. FLASHBACK: It's 3am on a Sunday morning, I'm shivering on a Brooklyn street corner in the dead of winter, clutching a slice of pizza and wishing aloud that I could actually crawl inside of it, where it's safe and warm. 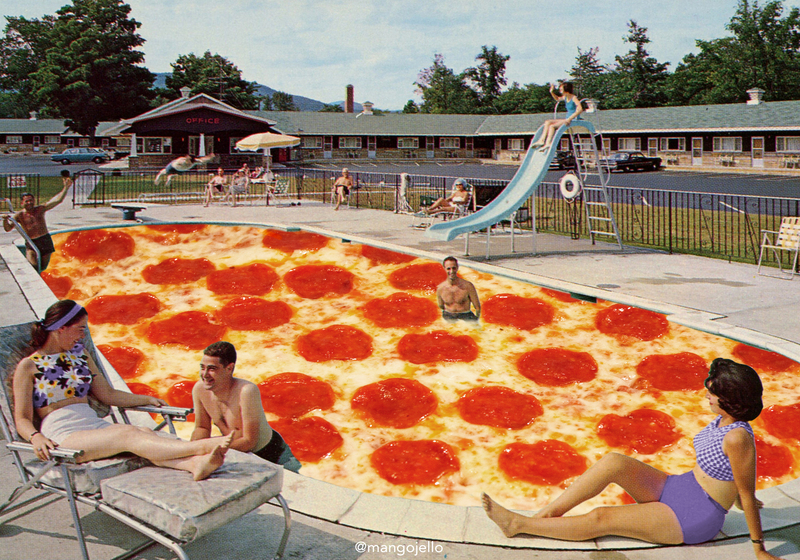 Suddenly, somewhere deep inside my frozen and beer-fueled brain, Pizza Bed was born. Later that morning (after some coffee and photoshop) the design landed in the "weird stuff" section of my online portfolio. But was I the only one who wanted that holy moment - when a piping hot slice hits your frozen hands after you've been dragged from bar to bar, the indication that it's finally time to go home and stop pretending you love meeting strangers - to last forever? I discovered this about a year later, as I was scrolling through Instagram and my Pizza Bed popped up on my feed. Then it started showing up on some of my favorite internet places like Buzzfeed, Mashable, @diplo, and @thefatjewish, so I decided it was time to make this dream a reality for all my pizza-loving brethren. I'm here because I love pizza and I want to sleep inside it. If you feel as strongly as I do about the most perfect food in the universe, then the Pizza Bed is the bed for you. Each Pizza Bed comes with a fitted sheet, a flat sheet, a duvet cover, and two standard pillow cases. Production will take approximately 60-75 days. Once I have received the sets, I will ship them out in their own custom pizza boxes. WHAT OTHER COOL THINGS CAN I GET? $5 - A hand-written thank you note sealed with a pizza grease kiss AND posi vibes for your next slice of pizza. 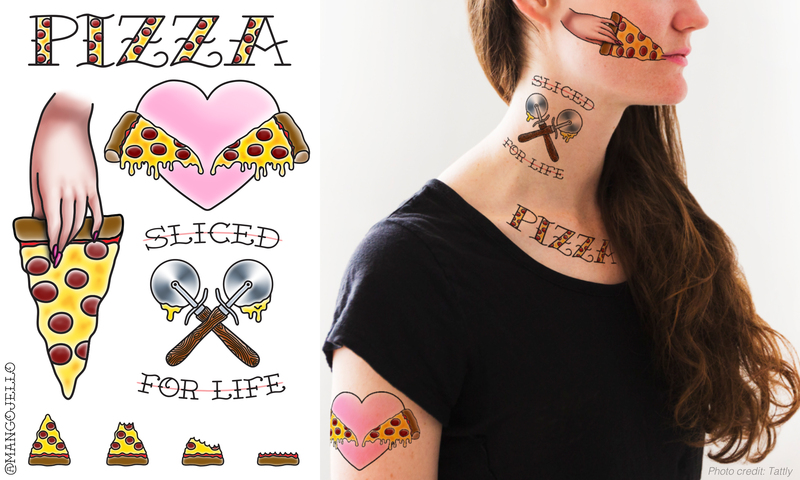 $15 - A sheet of pizza themed temporary tattoos AND a hand-written thank you note sealed with a pizza grease kiss AND posi vibes for your next slice of pizza. $50 - All three 8" x 10" pizza prints plus everything else. $100 - The ultimate Pizza Bed topping - a handmade, cross-stitched "Rest in Pizza" pillow. $200 - If you're like "I want a Twin Pizza Bed but I also want all that other cool stuff!" $225 - If you're like "I want a Full/Queen Pizza Bed but I also want all that other cool stuff!" $250 - If you're like "I want a King Pizza Bed but I also want all that other cool stuff!" $350 - Get one of the prints on 36" x 48" canvas to hang above your bed. $500 - I will get a pizza fade. That's right - pizza shaved into the back of my head. I'll send you a snapchat for proof. $1,000 - I will design a custom, one-of-a-kind pizza artwork on 36" x 48" canvas to hang above your bed. $10,000 - Dear celebrities and/or moguls who have posted Pizza Bed on their instagrams, this is for you *cough, cough...Diplo...cough. * Receive 10 Pizza Beds in whichever sizes you need. Plus 10x everything else. And my undying love and friendship if you're into that. Since you can only make a single pledge and only select one tier, please add up the amounts for the other items you would like and change your pledge amount once you've selected your base tier. For example, if you want two Twin Pizza Beds, select the Twin Pizza Bed tier and change the pledge amount from $150 to $300. Just want more other cool stuff? Like two sets of prints ($50 + $50) or three sheets of tattoos ($15 + $15 + $15)? The combinations are limitless. The world is your pizza. If you want a reward that has a backer limit (eg. the Rest in Pizza pillow) and something else, please make sure you select the limited item as the base tier. After the Kickstarter, I will email you to confirm exactly which items you want. If you have any questions, please do not hesitate to contact me! Claire is a Brooklyn-based art director and pizza enthusiast. She's already owned two businesses - both, albeit, unrelated to pizza. This will be her third endeavor into making cool s**t for other people that she thought she just wanted to make for herself. All designs are owned and copyrighted by Claire Manganiello. My main challenge is that the initial production cost is so high because I am required to make such a large minimum order. Other than that, production delays can always arise but I will keep everyone informed if the timeline changes. I will send out posi vibes for your next slice of pizza: may its crust be chewy & crispy, and its cheese never burn your tongue. You will receive a hand-written thank you note sealed with a pizza grease kiss AND posi vibes for your next slice of pizza. You will receive a sheet of pizza themed temporary tattoos AND a hand-written thank you note sealed with a pizza grease kiss AND posi vibes for your next slice of pizza. EXTRA PILLOW CASE - For King Beds or if you drool a lot. 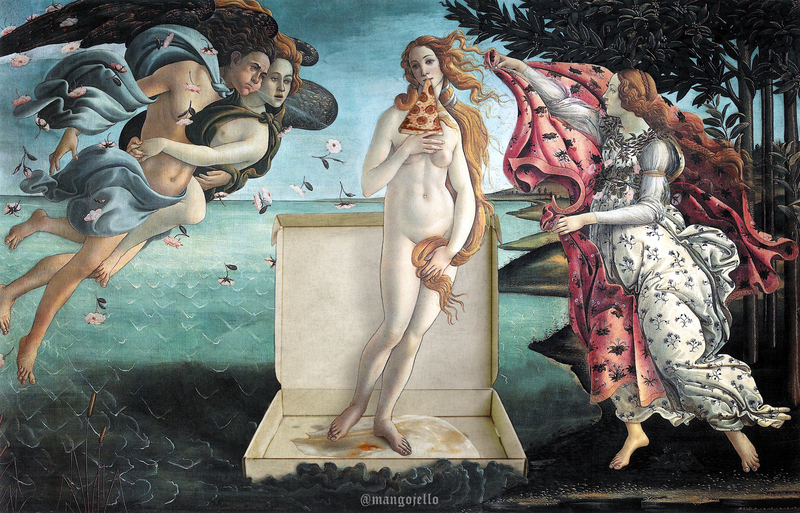 "The Birth of Pizza" - You will receive one 8"x 10" print to adorn your nightstand AND a sheet of pizza themed temporary tattoos AND a hand-written thank you note sealed with a pizza grease kiss AND posi vibes for your next slice of pizza. 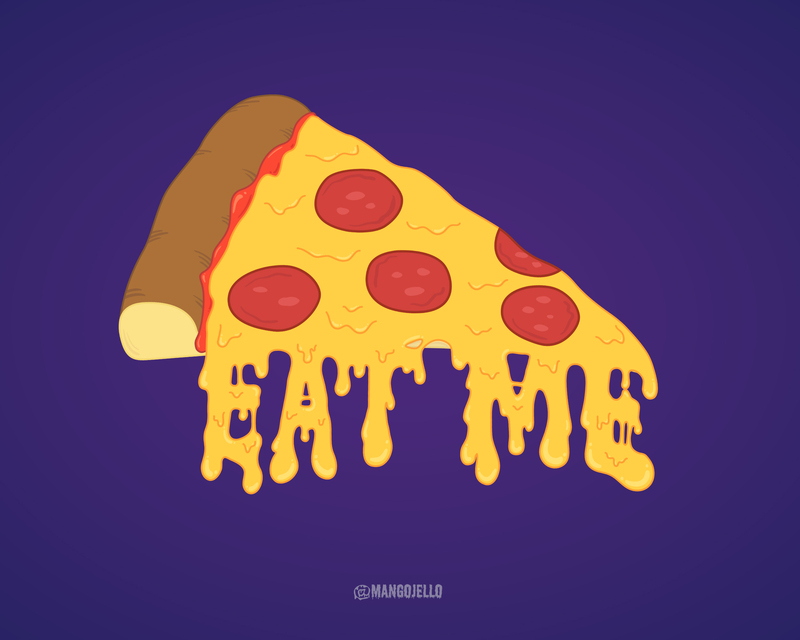 "Eat Me" - You will receive one 8"x 10" print to adorn your nightstand AND a sheet of pizza themed temporary tattoos AND a hand-written thank you note sealed with a pizza grease kiss AND posi vibes for your next slice of pizza. "It's a Pizza Party" - You will receive one 8"x 10" print to adorn your nightstand AND a sheet of pizza themed temporary tattoos AND a hand-written thank you note sealed with a pizza grease kiss AND posi vibes for your next slice of pizza. You will receive all three 8" x 10" pizza prints to adorn your nightstand AND a sheet of pizza themed temporary tattoos AND a hand-written thank you note sealed with a pizza grease kiss AND posi vibes for your next slice of pizza. You will receive the ultimate Pizza Bed topping - a handmade, cross-stitched "Rest in Pizza" pillow. EARLY BACKER TWIN PIZZA BED - Cheese & pepperoni duvet cover (66" x 96"), sauce fitted and flat sheets, 2 standard crust pillows. EARLY BACKER FULL/QUEEN PIZZA BED - Cheese & pepperoni duvet cover (92" x 102"), sauce fitted and flat sheets, 2 standard crust pillows. TWIN PIZZA BED - Cheese & pepperoni duvet cover (66" x 96"), sauce fitted and flat sheets, 2 standard crust pillows. EARLY BACKER KING PIZZA BED - Cheese & pepperoni duvet cover (102" x 108"), sauce fitted and flat sheets, 2 standard crust pillows. FULL/QUEEN PIZZA BED - Cheese & pepperoni duvet cover (92" x 102"), sauce fitted and flat sheets, 2 standard crust pillows. KING PIZZA BED - Cheese & pepperoni duvet cover (102" x 108"), sauce fitted and flat sheets, 2 standard crust pillows. TWIN PIZZA BED + EVERYTHING ELSE - Cheese & pepperoni duvet cover (66" x 96"), sauce fitted and flat sheets, 2 standard crust pillows. PLUS all three 8" x 10" pizza prints to adorn your nightstand AND a sheet of pizza themed temporary tattoos AND a hand-written thank you note sealed with a pizza grease kiss AND posi vibes for your next slice of pizza. FULL/QUEEN PIZZA BED + EVERYTHING ELSE - Cheese & pepperoni duvet cover (92" x 102"), sauce fitted and flat sheets, 2 standard crust pillows. PLUS all three 8" x 10" pizza prints to adorn your nightstand AND a sheet of pizza themed temporary tattoos AND a hand-written thank you note sealed with a pizza grease kiss AND posi vibes for your next slice of pizza. KING PIZZA BED + EVERYTHING ELSE - Cheese & pepperoni duvet cover (102" x 108"), sauce fitted and flat sheets, 2 standard crust pillows. PLUS all three 8" x 10" pizza prints to adorn your nightstand AND a sheet of pizza themed temporary tattoos AND a hand-written thank you note sealed with a pizza grease kiss AND posi vibes for your next slice of pizza. Get one of the prints on 36" x 48" canvas to hang above your bed. I will get a pizza fade. That's right - pizza shaved into the back of my head. I will design a custom, one-of-a-kind pizza artwork on 36" x 48" canvas to hang above your bed. Dear celebrities and/or moguls who have posted this on their instagrams, this is for you *cough, cough... Diplo...cough. * Receive 10 Pizza Beds in whichever sizes you need. Plus 10x everything else. And my undying love and friendship if you're into that.